**Latest additions - toolwindow skinning, tab page backgrounds and new tabs for Dark subskin, menu ticks/icons, more visible alert button, numerous tweaks. Has full support for WB 4.0 with XP shellstyle additions (left panel of explorer, control panel and logoff/shutdown windows). A WB skin by TheGreenReaper and AJCrowley. Original concept by Michael K Ter Louw, additional graphics by Ian Black, used with permission. Designed above all to be a usable skin, Blackcomb uses the UIS1 format for top performance and compatability (UIS2 backup included). Fully supports user colourisation and XP features - click the squares to reveal rollup and ontop. Includes Blackcomb Dark subskin for those preferring dark skins. WB 3.2 or later recommended on XP for large panel support, 4.1 for all features. This was well worth the wait guys. You did an excellent job! AJ deserves the credit for the cool stuff like the Start Panel - I just put it all together. Bugger ...I started my first wb skin a couple of days ago - its was based on Longhorn. Back to the drawing board then. Wow, I've been hoping for weeks for someone to put out this skin. My wish came true. Great job! Very strange. Does the preview look right? Check that it extracted correctly - there should be (I think) 151 files in the directory, excluding WBD files, and the .wba should be about 212k. I really like how you used the Whistler look. This is the first Blackcomb skin that I actually like. Great job! Really like the skin! It's become my favorite. Do have one question though - the 'rollup' option does not appear in all my windows. Should it be like that? 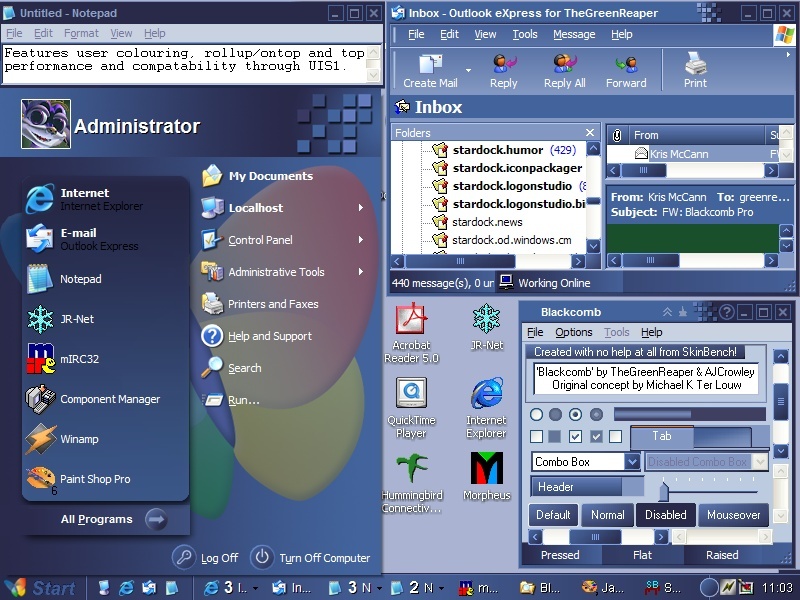 I'm using WinXP. It should not appear when the window is maximised, because rolling up when maximised is not generally a good idea (this is also why the maximise button is disabled when rolled up). Thanks for your help - I wasn't sure if there might of been a problem with my PC or not. Great job! Very nice skin, only funny thing is, that the roll-up button only appears when the window is not maximized (using XP prof, WB3.1). Other than that, it's beautiful. Yep. Intentional. Rolling up when maximised can have bad effects on some systems (as can maximising when rolled up, which is also discouraged by removing the button). I'm just curious, you don't happen to have a background that goes along with this do ya? This skin is so good I actually made a background for this myself. It's simple but it looks good. CyBeRiANx: There may be a wallpaper for it in the works if I get time over the next few days. I really like this skin a lot. Very good work! I have some problems with it though. A program that I use, dreamweaver (web page design program) has a properties window which has it's titlebar on the left side of the window. Your skin puts a titlebar on the top of it, which covers some options at the top. This doesn't happen with any other skins, if you could fix this I would be very greatful! Mike, Kosati: Erk. Not good. I've not had that reported anywhere else. Does inserting the line CaptionHeight=23 (or =24) in the [Metrics] section of Blackcomb.uis and reloading help in any way? Does this problem occur in Watercolour or other UIS1 skins?